Hello Everyone, I’m Mae McKenna and I’d like to welcome you all to Heartvox. I started the concept of Heartvox in response to what I perceive to be an increasingly generic approach to singing in the mainstream. When coaching singers, I work on improving their general musicianship, rhythm, improvisation skills and most importantly - drawing out what is unique in their voices and ability to communicate what is in their heart. Whether you are interested in coaching, my own music, The Rhythm and Roots Choir or just tuning into my blog and connecting with others interested in singing, I hope you’ll find something to interest you here. I have been a professional singer and songwriter since the 70s. Since then, I have recorded one album with the original “Contraband”, 6 solo albums and many guest vocals with other artistes. In addition to my solo career, I have have been very successful as a session singer and vocal arranger. I’ve sung on over 200 top ten hits, numerous TV and radio commercials, films and television shows. This experience across multiple genres has equipped me to help singers gain skills in all contemporary styles.  Contact info@heartvox.com for individual and group lessons as well as workshops and lectures.